The driver of a Bangkok Chinese tour bus was alerted that a foreign tourist was under his vehicle yesterday morning. Tourists on the bus looked on in horror as the tourist was retrieved from under the bus: his left arm was detached and he was in a coma, reported Sanook. Sawang Boriboon foundation medics performed first aid at the scene as members of the public provided shade from umbrellas in the sweltering heat. The man - name and nationality unknown - was taken to Muang Pattaya Hospital. Driver Parinya, 47, said he didn't see the pedestrian. He was only alerted to the accident when a member of the public informed him that someone was being dragged under his bus. The accident happened in the road leading to South Pattaya around 11.30 am. Driver Parinya, 47, said he didn't see the pedestrian. If your eyesight is so poor, or you pay such little attention to what is on the road in front and around you that you can't see a pedestrian, or notice the bump when you hit him, one has to ask why the hell are you being allowed to drive for a living? This sort of thing happens way too often. The people driving on our roads for work are so awful at it, I am actually a little stunned that we have any tourists left whatsoever. The local driving standards are doing their best to reduce the number of tourists, whether it's on the sea or on land. If its South Pattaya road (looks like it) then not surprised the driver didn't feel "the bump" as the road surface is bad and all the drain covers (near Wat Chai) are 2-3 inches below the surface again..some have been covered with steel plates that are 3-4 inches above road level...its a very bumpy road. Hope the victim recovers from this horrible accident. Surprised there are not a lot more of these type of accidents during Songkran. Yes, but what about the pedestrian's eyesight? Couldn't he see the bus? Was he trying to cross the road, or just walking on it, the article doesn't say anything about it? PS. I'm not trying to blame the victim. I think you answered your own question. Any tourist without a host of addictions and a wad of cash will think twice about heading over to Thailand and putting themselves at risk. 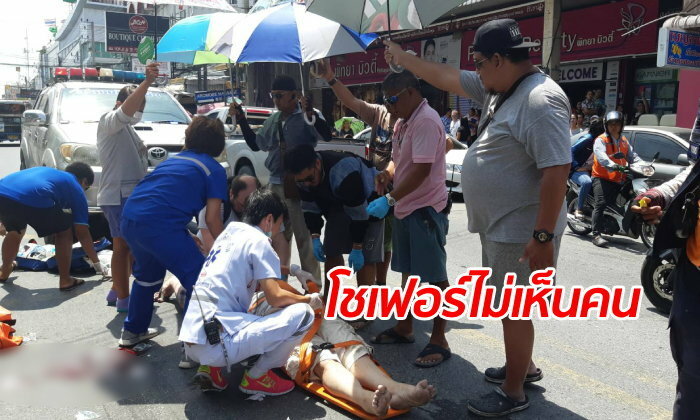 How about "Pedestrian dragged under tour bus in South Pattaya" instead of "Foreign pedestrian dragged under Chinese tour bus in South Pattaya"? Does the nationality of the people in the bus really matter? And does it matter if the pedestrian was foreign or Thai? Unbelievable that any driver would not be aware of a pedestrian being dragged by his vehicle. Brain dead bugger should not be on the road. One can only hope he was well insured IF he doesn't die from such trauma. It matters a lot, both. I am happy Sanook is not PC.